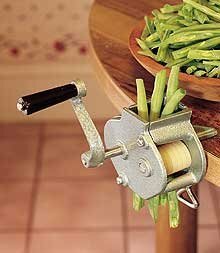 These devices have been around for decades; your great grandmother may have used one very similar to this to speed preparation of green and yellow beans for canning. Note: In response to requests for canning products and books, I've added this page, and I've found a reliable shipper/supplier (Amazon.com) for the products here. I appreciate your business- buying the products here helps support the website! If you are looking for pea shellers, see this page. Cut down on tedious preparation time. 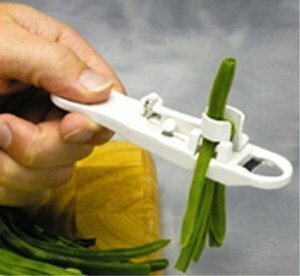 Easily slice fresh green beans in elegantly slender French-cut slices. Simply feed beans into hopper while turning hand crank. 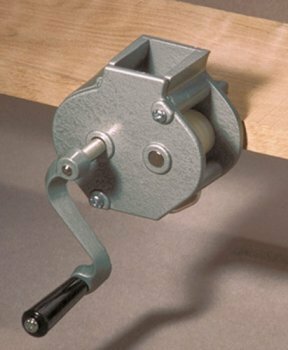 Clamp mounts onto edge of table (up to 1-1/4" thick). Heavy-duty construction with stainless steel blades. Here's an inexpensive design from Golda's Kitchen. 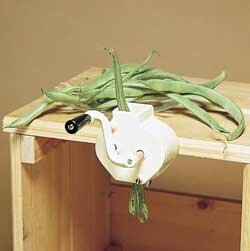 It is the Norpro French bean slicer. This one is ok for making enough sliced beans for a meal, but would be pretty tedious if you were canning or freezing and substantial quantities . This one comes from Gurney's Seed, and is very similar; but in a white finish. And here is one more, that is very similar to the first, just through a digfferent vendor!